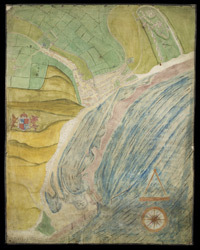 This coloured bird's eye view shows Dover harbour in 1581 before the new works of 1582. At this time the harbour was in need of restoration to prevent the build up of silt.The harbour and its immediate surroundings have been drawn to a scale of fourteen poles to an inch with the images of buildings superimposed. The castle is shown in detail, it was the first to make such extensive used of wall towers, a feature that has not escaped the draughtsman. The royal arms feature, suggesting that this drawing was submitted to the Queen. Thomas Digges was the head engineer under whose command the new works proceeded. The Crown’s engineers undertook the harbour works.